So you’re getting a brand new combi-boiler but you’re unsure which room or location in the house is best. This handy guide will help you decide. Traditionally, boilers have been installed nearest one of the sources where they’ll be heating most of the household’s water – in, or near, the kitchen or the bathroom. Having the boiler in the bathroom works well on several levels – firstly, it is closest to one of the rooms that uses most of the hot water and will heat the water quickly, and secondly, it will likely be a convenient location for the necessary pipework as the flue can sit alongside the existing pipework and the boiler’s waste (condensate) pipe could connect to the existing bathroom waste. Both the flue and the waste pipe will have to run outside and your boiler must be a suitable distance away from any doors or windows for this reason. Your boiler will also need to be located either on, or next to, an outside wall. Your engineer will be able to advise on this. If you have a bathroom big enough to accommodate your boiler then you could have it boxed in to create storage space for towels, which will be kept nice and warm by the warmth of your boiler. Similarly, the boiler could be housed just as easily in an airing cupboard just outside the bathroom, which is also a preferable solution for many. The kitchen is another ideal place for a boiler because it will be close to any appliances that need it such as the dishwasher or washing machine, as well as the kitchen taps. In addition, any noise from the boiler will be confined to the kitchen where it will cause less of a disturbance. That said, modern comb-boilers tend to be fairly quiet nowadays. However, if your kitchen is on the smaller side, this might not be an ideal location. If you have a small kitchen but a utility room then the boiler could easily go here. Under the stairs might be another area for consideration, but it might be impractical here unless the stairs are next to an exterior wall and there is easy enough access to the space for an engineer. If you don’t have the available space for the boiler in the bathroom or kitchen, and perhaps don’t have a convenient place outside either of those rooms, then perhaps you might consider the bedroom. While this could create issues with noise, the boiler could be placed in a wardrobe or purpose-built cupboard to reduce any noise. Ideally, it would also need to be placed close to a bathroom so the waste pipe could be extended there. Finally, the attic or garage might be considered as locations for the boiler, however these places come with complications. Firstly, the attic would need to be boarded or have some flooring so the boiler can be easily accessed. It should also have enough space so that it can be easily accessed for service. This also means adequate lighting and steps or a lift ladder. 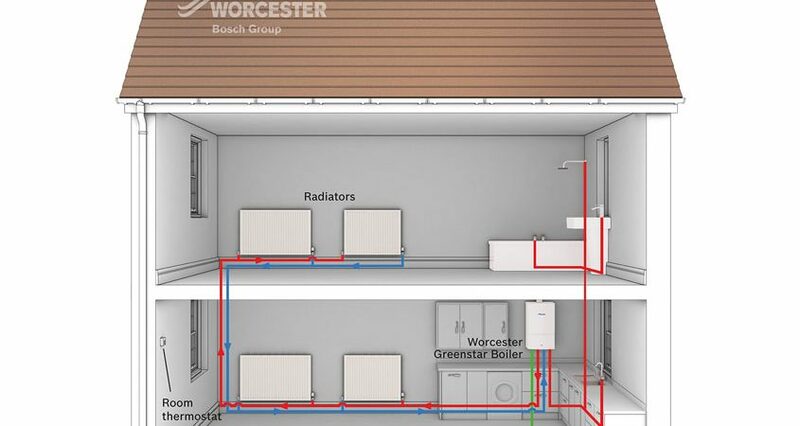 Also, installing the boiler in the attic could well mean wasting energy as it will be so much further from your water-using products in the kitchen and the bathroom. You would also need to ensure that the attic has adequate frost protection. And then there are structural considerations. Is the wall strong enough? Do you want to make a hole in the roof for the flue to take the steam? Is that possible? The issues with a boiler in a garage are similar to the loft. The boiler is likely to be relatively far away from all of the appliances that need it, meaning lost energy, and there is a greater chance of pipes freezing because the garage is generally unheated. If you’re thinking of buying a new boiler or relocating an existing one, don’t hesitate to get in touch with Diamond Gas and Heating, where our friendly team can talk you through all of your options.